With kindergarten registration behind us, the next question on many a Vancouver mom’s mind is, “Will my child be ready?” Today we have some tips to help your child prepare for kindergarten from Tenessee Briand of Little House Tutoring. Sending your children off to kindergarten before they are ready is like going to your first university lecture without a laptop or textbooks. To participate in class, you need to be prepared with the appropriate tools. How do you help your children to prepare for kindergarten? As their first teacher you can make sure they have the tools and skills necessary to feel confident. The better prepared your children are, the more they will get out of it, and the less likely problem behaviours will arise. The first years of your children’s education are formative, so send them out into the world with the confidence and the knowledge they’ll need, in order to use their voices and be heard. As an educator, I know the importance of starting early when you prepare for kindergarten. Children are never too young to begin learning the fundamentals that will help set them up for future achievement; don’t take for granted the ability to hold a pencil properly or to sit in a seat for any amount of time. By cultivating these most basic skills early you are increasing the chances of future success significantly. That is why I would like to put the confidence back into parents as educators, so I have chosen three of the easiest and most practical lessons you can do at home to help prepare your child for school. And remember, the way your child feels about learning now, can affect how they feel about it for the rest of their lives, so always try to make it fun! or felts incorrectly, you simply say “clip and flip” as a positive reminder. ways of helping themselves is the beginning of teaching independence, which will make them more confident learners. This is a great activity for teaching almost any concept. Let’s begin with teaching letter sounds. Now, you don’t want to overwhelm your child, so begin with five or ten letters. Write the lower case letter on one card and then on another card draw a picture of a corresponding key word. For example, write an a, then draw a picture of an apple. On another card write a b and then draw a picture of a bat on yet another card. If you start with five letters then you will have ten cards altogether. Introduce the cards one pair at a time having your child repeat after you. “A says ah for apple” and then show them the pair, so on and so on. Lay the cards out on a table or on the floor ensuring that they are all mixed up and then play Matchy Matchy. Once your child has mastered these sounds add more until they know all the sounds of all the letters in the alphabet. 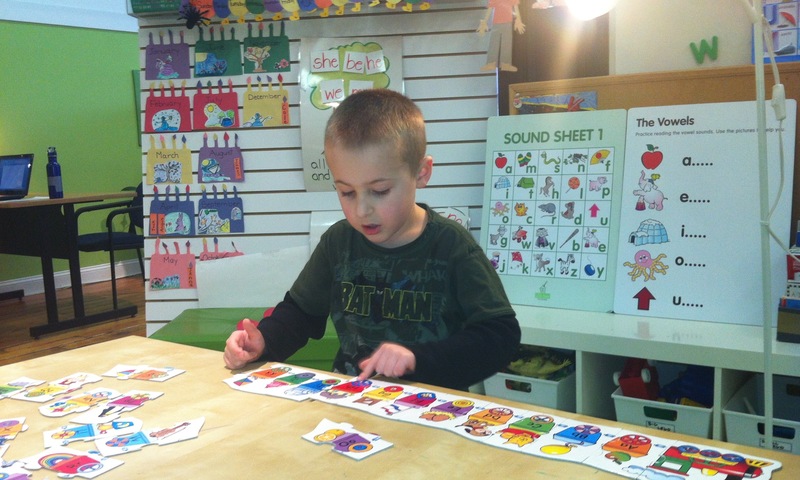 How are you helping your child prepare for kindergarten? Tenessee Briand is co-founder and co-operator of Little House Tutoring, a team of therapeutic tutors in Vancouver, BC, that specialize in teaching language skills to students of all ages with learning challenges. Tenessee believes that learning should be fun, and that Little House should be a place of warmth and comfort for their students. She wants every student to have a positive memory of their educational journey and that they felt special and important at Little House.